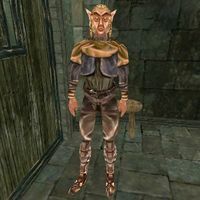 New-Shoes Bragor is a Bosmer thief and Wet Ear of the Thieves Guild who is being held captive in the Imperial Legion prison in Fort Pelagiad. He is located downstairs in a South Wall prison cell. Once you arrange his release, he'll reward you with these new shoes that brought him no luck. This page was last modified on 13 May 2013, at 17:23.